Free Gifts from Bob Proctor! Enter your information to receive your free gifts! Share the love! Share Bob’s Free Gifts with your Friends! Did you know everything in life is a mind game? More importantly, did you know that everything you want, and everything you don’t want, are merely a few thoughts away at all times? Most importantly, are you living your life and playing the ‘mind game’ accordingly? 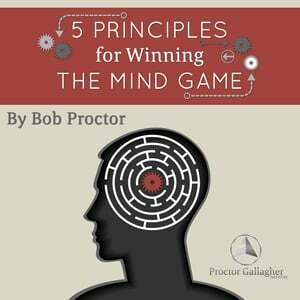 Listen to these 5 audios on Persistence, Confidence, Action, Goals and Attitude to fully understand the 5 PRINCIPLES for Winning THE MIND GAME. Here’s the trigger that will fire you into action. It contains the method for the effective expression of your mental images and is a powerful piece to creating lasting, genuine success. It’s all well and good to set goals, but even better when you know how to go about achieving them! Here, Bob Proctor shows you how to set goals for yourself that are truly worthy of your infinite potential (most people think too small). Then, he helps you narrow your focus on your priority goals and take the steps necessary to achieve one after the other. Persistence is to the human character what carbon is to steel. With Bob’s help, you’ll recognize the aspects and traits of persistence in others, and begin to incorporate its simple concepts in your own life for lasting, even phenomenal, success. You know what you want. With confidence, you also know how to get it. Learn how to develop “strength with style” as Bob Proctor shows you how your own, innate ability can improve every single aspect of your life. The magic word is attitude. Attitude is arguably the most important piece to any success puzzle and certainly a key you’ll want to master as you continue on your journey of personal and professional fulfillment and advancement.